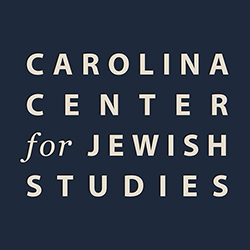 Carolina’s Jewish Studies certificate program for graduate students is the first of its kind at any college or university in North Carolina. The program is available to degree seeking graduate students studying in the humanities and social sciences at Carolina. It includes opportunities for graduate students to explore Jewish languages, culture, literature and history in both their coursework and research endeavors. • Completing three graduate-level courses on a topic related to Jewish Studies. Please note that at least two courses must be beyond the required courses for the student’s degree. This is a requirement of the UNC Graduate School. • Submitting a major seminar paper or a section of a broader thesis or dissertation on a topic related to Jewish Studies. • Demonstrating relevant language skills either by taking advanced language courses or by using primary language texts in a major research project. Click here to see course offerings. Provide information if you are interested in the graduate certificate in Jewish studies. Please list courses in Jewish Studies that you have already completed and/or that you plan to take to satisfy the certificate requirements. Please list the two courses in Jewish Studies that do not count toward your degree (a minimum of two must not be part of your degree requirements). Biblical Hebrew, Modern Hebrew, Yiddish, other?